Wee Care, a subject close to my heart. I couldn't even link *A* post about it, there are 68 posts that I have done about Wee Care! This time though, Wee Care has become a personal, heartfelt endeavour. My son and daughter-in-law are expecting their first baby. Stressfully though, that baby girl has kept us on our toes. Mommy has already been in the hospital for preterm labor and is now at home on bed rest. She is 28weeks 5days as of today and we are so proud of the great job she is doing incubating that sweet little one. Doctors have told them though the chances of going to term are pretty close to nil. Their goal right now is to get to 30 weeks. We will celebrate when that goal is reached. I pray that the new goal after will be 32 weeks. 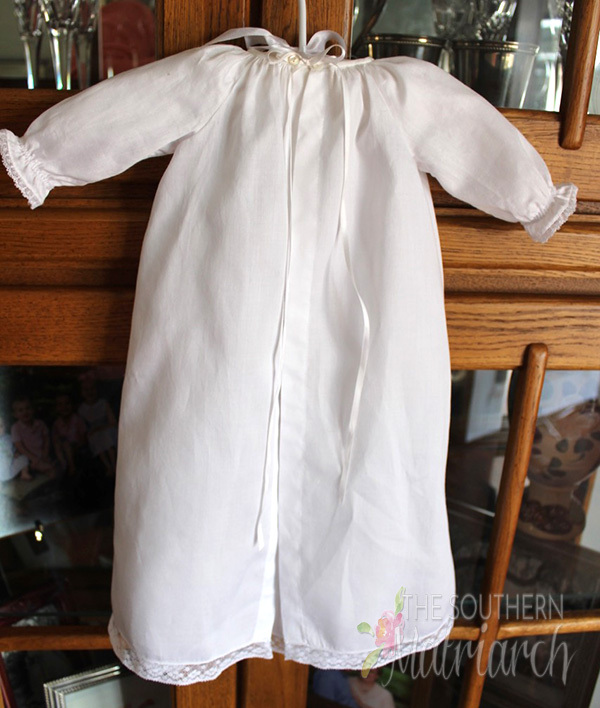 Fortunately, across the country, Wee Care gowns are not exclusively used just for bereavement any longer. That is certainly not my goal. We expect this sweet girl to grow into a feisty little one just like her five cousins. Whew. All that being said, even Preemie Princesses need Mimi-mades. Also UFO's come in handy as well. 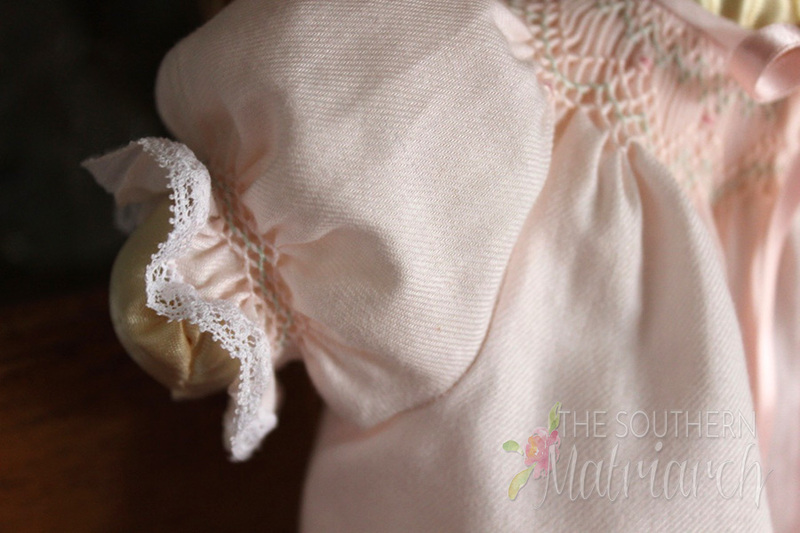 I found this little gown smocked minus the sleeve smocking. No neckband or hem. I have no idea what my initial intention had been for this sweet gown but I am glad I found it. Don't you just love a sweet puffed sleeve? 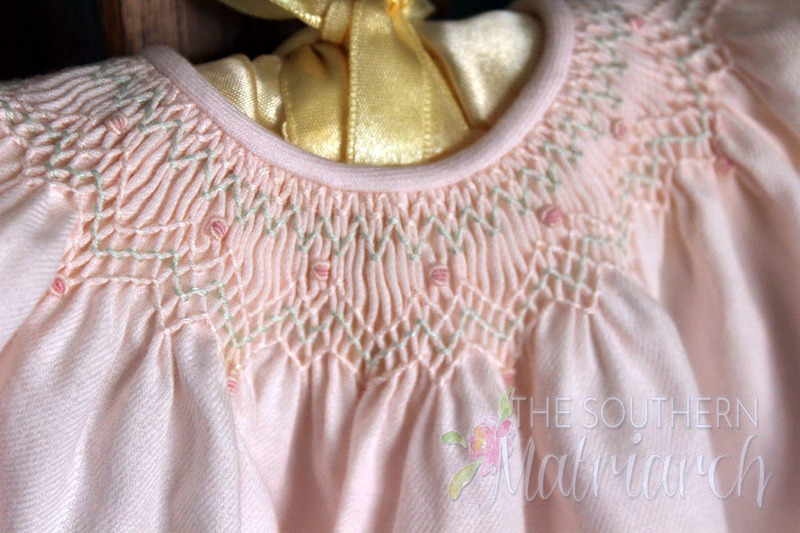 The other sleeve shows the smocking. It also shows the sweet, cozy, texture of the Swiss flannel. Love Swiss flannel. This gown was made with scraps I am sure. A word to the wise or from those that learned the hard way; when you start a project, take a Frixion pen, write on a scrap of fabric the floss colors/numbers, size and pattern used and stitch it to the garment somewhere. Trust me. I had not done that, the project was not in a bag with the floss included as is usually the case. It was in a basket with other Wee Care gown kits, loose. (I advise using the Frixion pen on fabric and loosely stitched to the project with thread to avoid a myriad of problems. For example, a piece of paper that is not acid free could stain your project. Standard ink on paper could become damp and bleed the ink onto your project. Using pins or staples could leave rust on your project. There are all kind of pitfalls.) Thank goodness for an Ott Lite and thread cards. 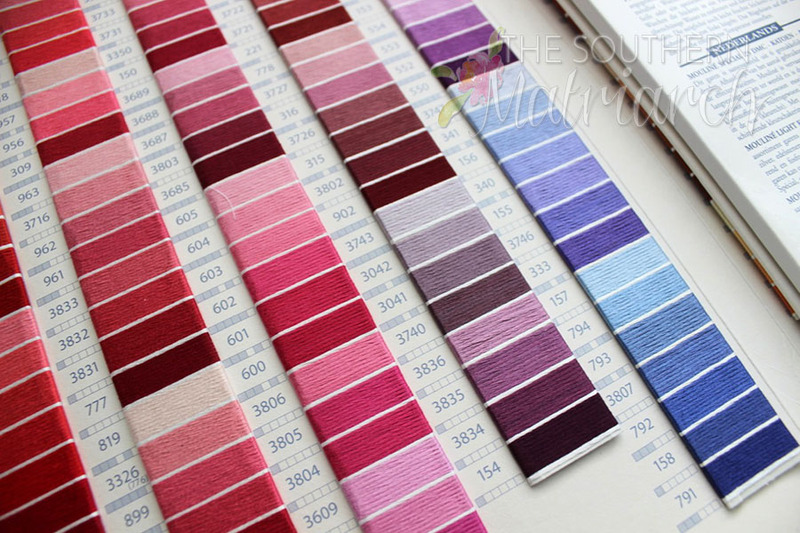 I am so glad that a few years ago, I invested in these thread charts that contain actual thread samples in them. After a bit of trial and error I was able to determine the floss colors I had used to stitch the sleeves and a couple of bullions. FYI: I don't believe either of these thread charts are available with the actual thread in them any longer. They do become available on eBay and Etsy on occasion. They are worth the search and the $ if you find them. The newer ones are printed color charts with pictures of the thread. Not as accurate. As I said before, the gown is made from Swiss Flannel and is a gown made without side seams. 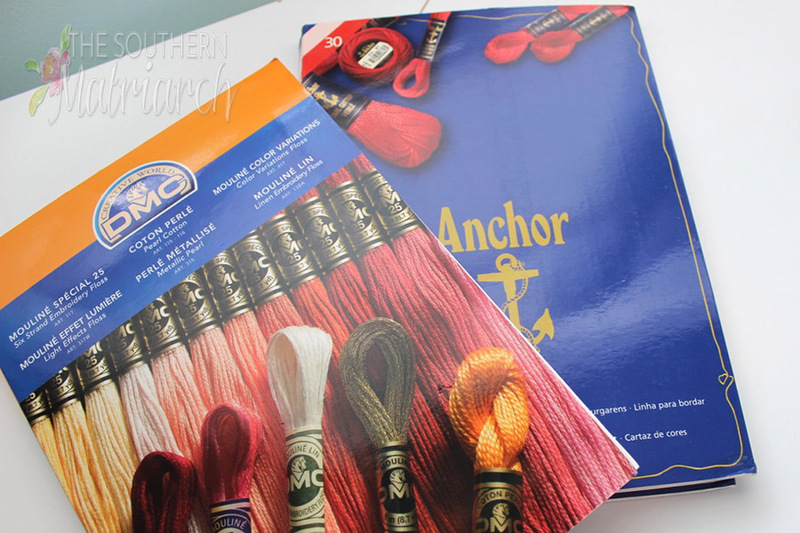 It was featured in Issue #48 of Australian Smocking and Embroidery. So sweet. Instead of a turned up hem I finished the hem with a narrow lace. The back is closed with ribbon and antique buttons. 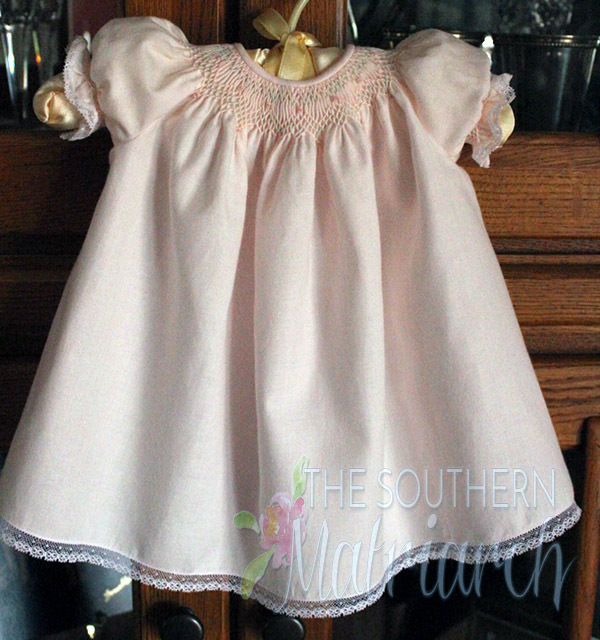 This sweet gown is intended for a baby that weighs 3-4 pounds. 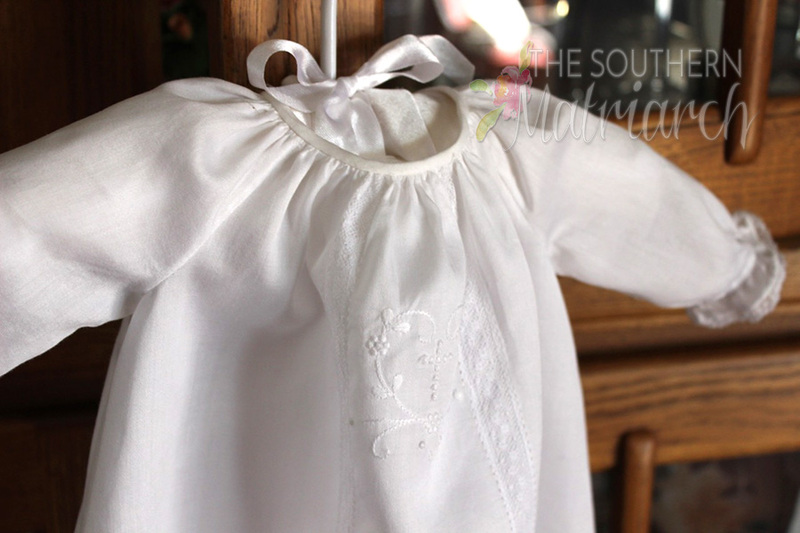 The pattern includes sizes from Teeny Preemie around 1# all the way to newborn of 5-6 #. I didn't want any snaps, buttons are velcro down the back because preemie babies have very tender skin. 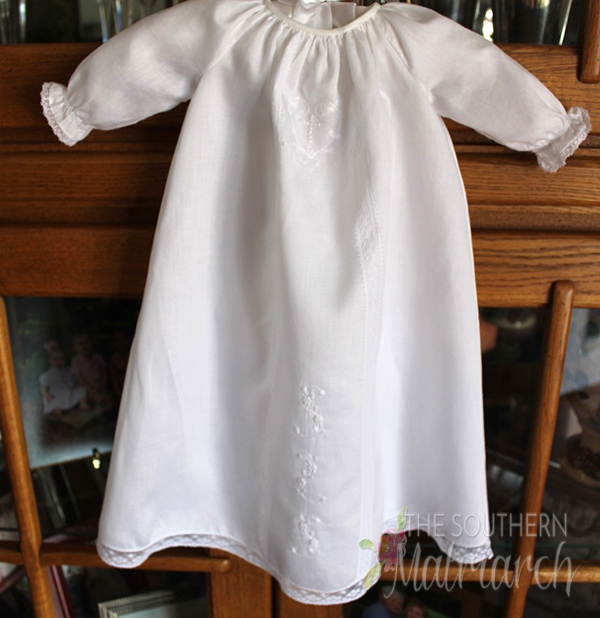 We all know I love a christening gown and have a full on one in the works for this baby girl. Mommy and Daddy want her to be baptized immediately after birth. 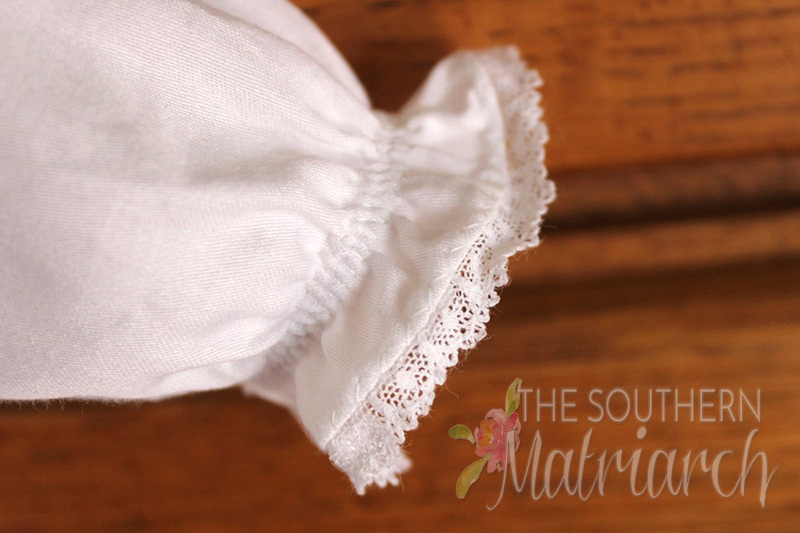 There is no way a 2-3# baby could wear a 39", size 3-6 months gown, so I made a Wee Care gown that can be used for the interim. I stitched this while Mommy was in the hospital trying to stop labor so I wanted it to be quick but still pretty. I used Ginger Snaps Baby Daygowns Book IV. Obviously the non-smocked version. It also comes in sizes of 1# to 6#. This is the 2-3# size. 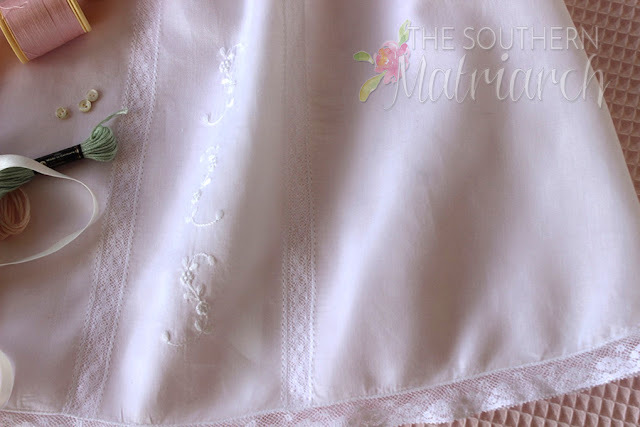 Since I didn't have time for hand embroidery not knowing how long I had to finish the gown, I opted for some simple machine embroidery. I used a couple of designs from The Christening 2 Collection by Custom Keepsakes. 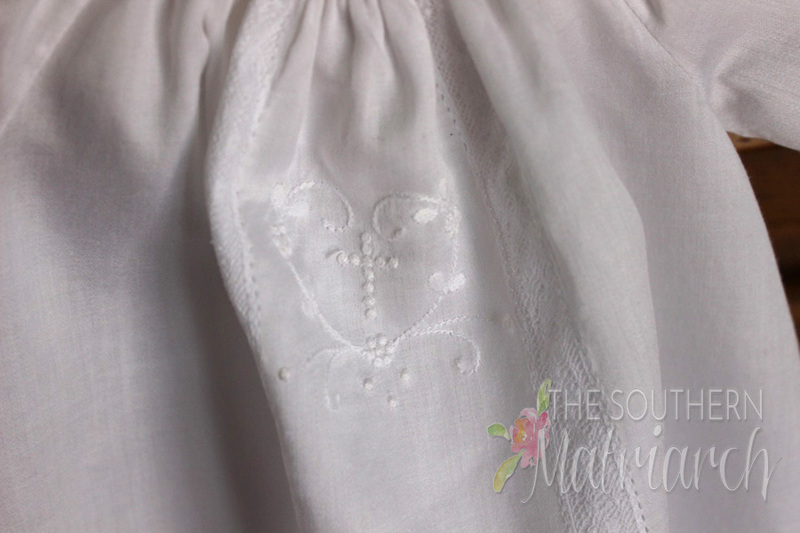 The fabric is satin batiste and I used DMC 50wt embroidery thread for the embroidery. Not a project for shiny polyester embroidery threads. I used a machine pin stitch to attach the lace down the front. Again, from a leftover fabric from another project. That stash closet does come in handy. Excuse the back, it had been handled quite a bit trying to photograph it, so it was getting wrinkled. 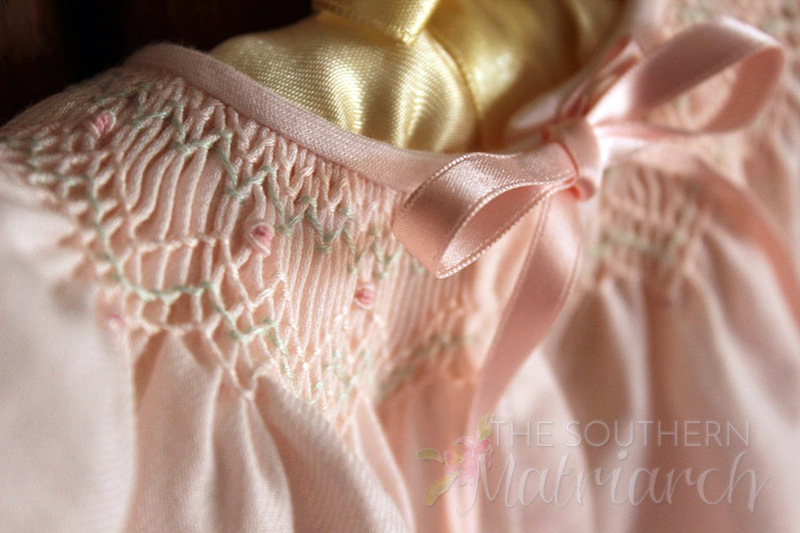 I used the same closure as the pink gown. Just a couple of antique buttons to hold down the ends of the ribbon ties. This is before I tied the ribbon in a bow so you could see the tiny buttons. That neckband is only a tad over 1/8" wide, so those buttons are tiny. 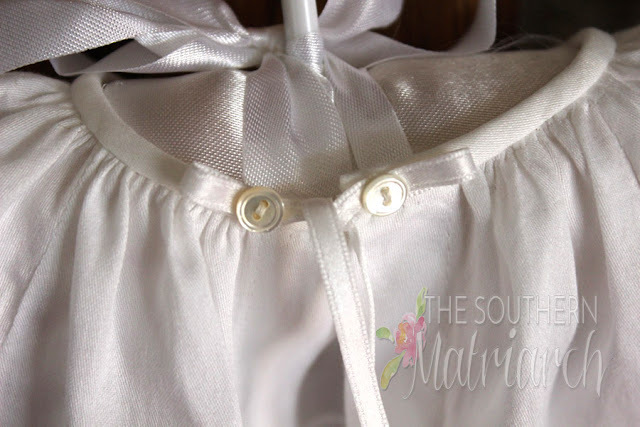 The buttons at the neck aren't as likely to mark or scratch their tender skin as a button closure down the back of the gown. Again, I didn't want snaps or velcro either. Another sweet sleeve with narrow lace at the edge. 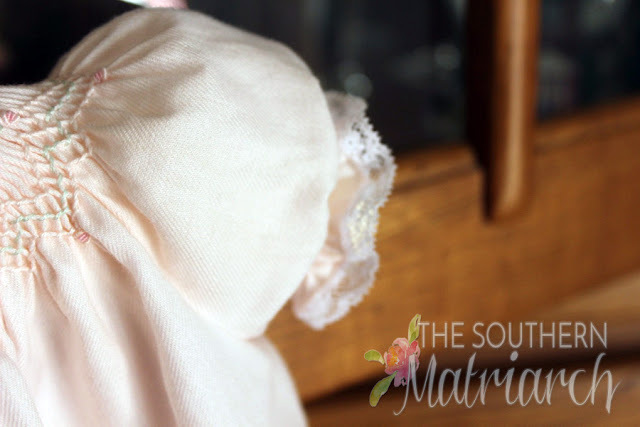 Even if baby can't be completely dressed in the gown we can lay it over her in the isolette and she will have a Mimi made gown for a special moment. We will use the full size gown later on to have an at home celebration and portraits when she arrives home. 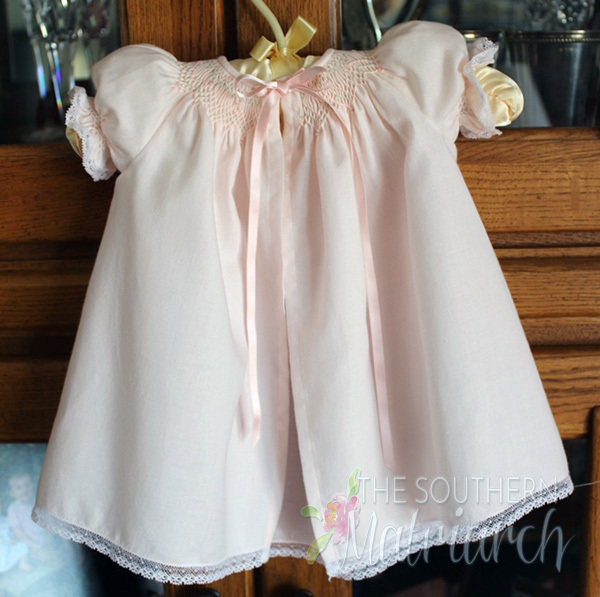 As we continue to pray for this precious girl, I have another Wee Care gown in the works. In a slightly bigger size. Wouldn't it be wonderful if she grew straight through these sizes before she is born. In a day or two I have photos of another sweet girl at her baptism. We have babies all around this time. I was in bed almost my entire pregnancy with my second child. He came 6 weeks early, weighing 6 lbs. 12 oz, 19" long. I was glad when you said you were making a bigger gown too! He was in preemie, but not for long! Prayers for this baby! Her gowns are gorgeous! Martha - will keep this sweet baby in thought and prayer as well as the entire family. I was blessed two years ago to become a Godmother to Jake - Jake was born at 24 weeks at 1lb 4ozs. Obviously, Jake spent many months in the NICU where I was constantly amazed at how well these tee tiny babies are understood, cared for and that modern day advances have produced tee tiny equipment and supplies to nurture these little ones but most of all these babies are very well loved by all who care for them. Jake is doing very well and brings much joy to everyone he meets. I was blessed to care for him for the first year of his life while Mom and Dad worked - he brought much love and joy to both my husband and I. Little known fact - amongst preemies the females are stronger. Your faith is strong Martha it will guide you and guide your family. Martha, my prayers are with you and your son, daughter-in-law and precious little one. Your gowns are lovely. I agree with you on the thread chart, I bought one years ago and it is so handy. Such a good idea about the label for the floss, I've lost the threads I've used and had to use the chart to figure out what I was doing. It would be so much easier to have had a note made. Prayers for your family, Martha...my cousin's daughter-in-law carried twin boys to term after being on bedrest for 12 weeks...your daughter-in-law is giving her little daughter every possible chance for healthy survival, and the Lord will keep her strong and your granddaughter safe...!! May that sweet baby stay put as long as possible. And peace of mind for all of you. As a grandmother, I feel your anxiety. Both of our little granddaughters came early. When labor with the second one started at 25 weeks, it was like a crash course in super-specialty care. We learned a new vocabulary. The doctor told my daughter, "Every day is a victory." And with hospital stays pre-delivery and bed rest, they made it to 33 weeks. And that sweet girl is 2-1/2 now. And all is good. Prayers for you all. Praying for your sweet baby. We went through this same thing 2 years ago but we have the sweetest, happiest, energetic little boy! We were on pins and needles everyday. But he is a blessing to our family. We have a 16 year old granddaughter that needs prayers. When you pray remember Alyssa. These are precious and beautiful beyond words. Sending all good wishes and prayers.